Researchers at the RIKEN Center for Sustainable Resource Science (CSRS) in Japan have demonstrated that that moss can be a green alternative for decontaminating polluted water and soil. Published in PLOS ONE, the study shows that in particular, the moss Funaria hygrometrica tolerates and absorbs an impressive amount of lead (Pb) from water. Lead-contaminated water is a serious environmental concern that has recently proved to be disastrous when left untreated. Compounding the problem, the typical way to remove lead or other heavy metals from water requires fossil fuels and a tremendous amount of energy. As an alternative to these typical processes, phytoremediation is a method that uses photosynthesizing organisms to clean up soil or water contamination. The CSRS researchers began their search for a phytoremediation-based removal method by looking at F. hygrometrica, a moss that is known to grow well in sites contaminated with metals like copper, zinc, and lead. "We found that the moss can function as an excellent lead absorbent when in the protonema stage of development," says first author Misao Itouga. "This valuable ability means that moss protonema will likely make exceptional wastewater cleaners in mining and chemical industries." To characterize the metal-absorbing ability of the moss, the team first prepared solutions with varying concentrations of 15 different metals and exposed them to F. hygrometrica protonema. After 22 hours of exposure, mass-spectrometer analysis showed that the moss cells had absorbed lead up to 74% of their dry weight, which is quite high and much higher than any of the other metals. Knowing where the lead accumulates is important for understanding how it occurs and for developing the most efficient phytoremediation. Analysis showed that within the moss protonema cells, more that 85% of the lead had accumulated in the cell walls, with smaller amounts being found in organelle membranes and inside the chloroplasts where photosynthesis occurs. Focusing on the cell walls, the team found that they absorbed lead even after being removed from living moss. This means that there is something special about the cell walls of this species of moss that allows them to thrive in environments that are toxic to other plants. Analysis with two-dimensional nuclear magnetic resonance indicated that polygalacturonic acid in the cell walls was responsible for absorbing the lead. 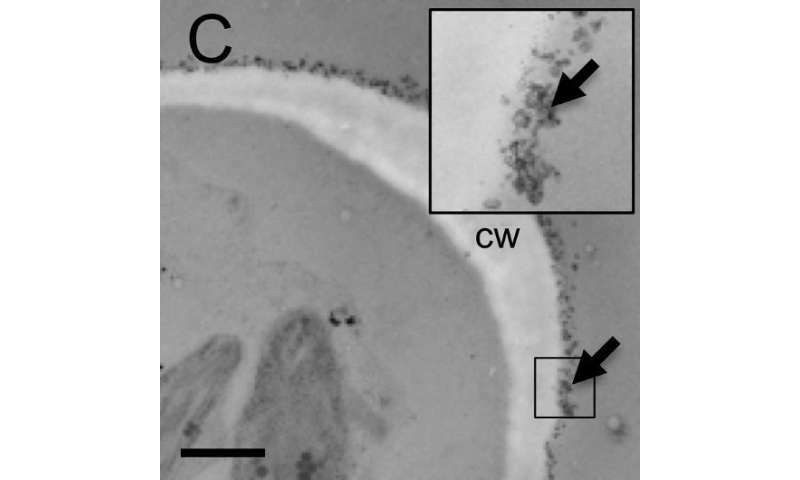 "We compared F. hygrometrica data with those from land plants and seaweeds", explains Itouga, "and found that the presence of polygalacturonic acid in the cell wall is one of the characteristics that separated this type of moss from other plants." They next determined that the protonema cells absorbed lead well at pH values between 3 and 9, which is important because the acidity of metal-polluted water can vary. "Our findings show that F. hygrometrica is a useful bio-material for recovering lead from aqueous solutions," says group leader Hitoshi Sakakibara. "and will contribute to the Sustainable Development Goals set by the United Nations, specifically the Life on Land goal. We are currently exploring opportunities to work with recycling-oriented companies."